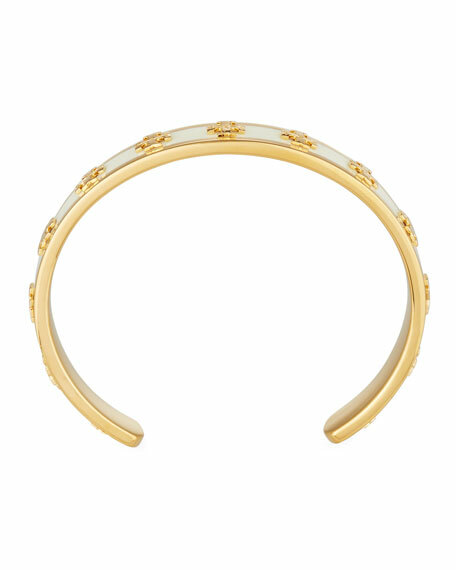 Cuff bracelet by Tory Burch. Enamel center with raised logo. Brutalist crystal encrusted cuff by Alexis Bittar. Ruthenium-tone and 10-karat gold plated brass. Two-tone open frame with Swarovski® crystals. Split opening eases dress; slip-on style. Approx. 2.5"H; 2.6"W. Made in USA. Alexis Bittar crystal encrusted freeform cuff. Polished 10-karat yellow gold plated brass. Interlocking open link frame with spikes. Multi-size round white crystal accents. Split opening eases dress; slip-on style. Approx. 2.2" diameter; 1.5"H. Imported. Gorjana "Lola" asymmetric sculptural cuff bracelet. Polished 18-karat yellow gold-plated brass hardware. Intersecting hammered wires form open frame. Approx. 2.8"
Gorjana "Lola" asymmetric sculptural cuff bracelet. Polished 18-karat yellow gold-plated brass hardware. Intersecting hammered wires form open frame. Approx. 2.8" x 2.3" inner diameter. Approx. 1.3"H at tallest point. Split back for slip-on style. Imported.